Established in 2007, Katie Farms is very much a new farm in the making. The owners and operators are Jon Fleenor and Margaret Purcell. The farm is located just west of Northport, Alabama, in the community of Coker which is in the Warrior River basin. It has some of the richest soil on which you can farm. It started out as a home garden and has grown from there. Our main goal is to stay small and produce the very best crops that we can. Among the in-season heirloom offerings at the farm are purple sweet potatoes, tomatoes, okra, onions, garlic, purple new potatoes, corn, peppers, and summer squash. Among the other offerings at the farm are free range, farm fresh eggs. Produce is sold directly to local restaurants in the Tuscaloosa area. In 2008, we planted around 50 blueberry bushes and 65 muscadine and blackberry vines. In November 2009, the farm started raising registered Scottish Highland cattle, the oldest registered breed of cattle, with a herd book published in 1885. 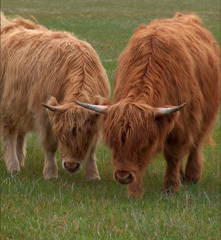 We are members of American Highland Cattle Association and the Heartland Highland Association. Our goal is to become a quality -- not quantity -- cow calf producer. We are also members of the National Cattlemen's Beef Association, the Red Angus Association of America, and the Southeast Red Angus Association. We have trademark registered the name Highland Red™ for the new breed of cattle that we are developing. We are breeding Scottish Highland bulls with Red Angus heifers to yield a polled bovine with the most desirable charateritics of both the Scottish Highalnd and Red Angus breeds. The new breed has the girth, calm nature, and sturdy legs of the Scottish Highland breed and the meat quality and lack of horns on the Red Angus breed. Often we find a new market by accident. We got some bee hives on the advice of a neighbor who told us that the activity of bees would increase plant production. It worked! We also soon discovered that we were good at raising bees. Soon we were selling hives locally. Although we have come a long way in such a short time, it could not have been achieved without the help of our local Tuscaloosa office of the USDA, NRCS. We are proud to be an innovative, hard working, and productive farm that can provide local home grown food to the local community. We are eager to provide agri-education and outreach in the west Alabama area, and we are proud to have introduced farm life to groups such as YMCA day campers, middle school students, high school students, vet school students, 4-H students, university students, girl scouts, OLLI participants, and residents of a senior living facility. Farm tours are available from October through Februrary by reservation made in advance Call ahead to make an appointment. Of course you can visit us at any time here or at our Facebook page to keep up with our activities at the farm. Be sure to check out our Facebook page to see our pictures of the day inlcuding regular features such as our employee of the week, free range Friday focus on our fowl, and Caturday - a sneak peak at the life of our barn cats. "From our fields to your table"